National Health Blog Post Month, Day 6: If I could do anything as a Health Activist… Get aspirational. Money is no longer an option. What is your biggest goal that is now possible? How could you get there? Now bring it back down to size. How much of this can you accomplish now, in a year, in five years? I really enjoy all of the wonderful ways that the ADA, JDRF, DRI, and other diabetes organizations have of raising money. We’ve got walks, bike rides, galas, thrift stores, and even our own drinks that help raise money for diabetes. It’s great! These efforts typically target people with diabetes to raise money for diabetes, but we don’t have a direct line of sight to the payoff for all that fundraising work. We’re all out there doing our walks, riding our bikes, gala-ing our galas, and drinking our drinks, and we’re raising money, but then what? I know that these groups are doing some amazing research and awareness work, and I don’t want to belittle those efforts at all. They are important, but they are also hard to see. When do we see that tangible thing that is a direct result of all that advocating and fundraising? When do I get my close up Mr. DeMille? Hopefully it will be sooner than we think. Last week, the JDRF and CEO Jeffrey Brewer took off the gloves and threw down the gauntlet. Or maybe it was the lancet. They threw down something. All I know is that it was in your face and to the point. And it was a full page in the New York Times and the Washington Post. And. It. Was. AWESOME. Yes, I said it. I want to see more from other organizations who will stand up to the naysayers who are holding back progress. I’m not anti-FDA, as I am grateful for the lives that they have saved by their oversight. However, I challenge both the FDA and diabetes organizations to do more and do it more expeditiously for the people with diabetes. If it benefits the cause and gets us closer to a tangible solution to a diabetes problem, I’d like to see these groups join forces and work together to save lives. Other countries are leaps and bounds ahead of the United States in what they do for people with diabetes. It is time that other countries looked to us for the advancements in how people live with diabetes, and it is us who should share these advancements with the world, and make sure that these advancements are accessible to everyone that needs them. Period. Follow JDRF’s lead. Say what you mean. Take the gloves off. Stop playing nice. There are clear winners and losers in this fight. Make sure the winners are the people with diabetes, and let’s all do what we can, together, to make advancements like the Artificial Pancreas a reality. NOW! I was very moved by the JDRF campaign, and what you wrote echoes a LOT of what’s in my brain. Thank you for this very articulate post, Martin. i freaking love this. so. much. 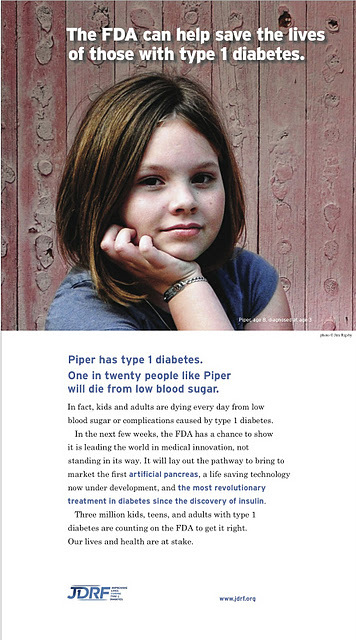 many, many, many kudos to the JDRF for having the balls to run this ad. and i didn’t even think about the money side of it. it’s time people without diabetes start understanding how serious this disease it. FANTASTIC post, my friend! Like you, I’m so glad that the JDRF “threw down something”. I’m appreciating this bolder approach! Pingback: victoria cumbow » Blog Archive » One too many.